By Kevin M. Cahill, M.D. 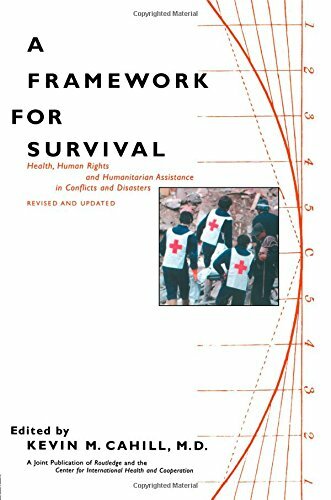 In A Framework for Survival: Health, Human Rights and Humanitarian Assistance in Conflicts and Disasters, contributions by an international team of experts demonstrate, inter alia, how global cooperation on health related problems can open doors to political negotiation. The text covers a wide range of crucial issues from the plight of refugees to the economics of neglect. “As fresh as today's headlines in reviewing the controversial political, legal and moral perspectives that are an indispensable precondition for rational and effective action," Joshua Lederberg, Ph.D., Nobel Laureate, Professor and President Emeritus, Rockefeller University. A Framework for Survival argues that the violent transition from the Cold War era to a New World Order offers opportunities for fresh approaches and policy initiatives. The text is based on a 1993 symposium at the Council on Foreign Relations, and was completely revised and updated for a second edition. A Framework for Survival is widely used in universities around the world. Originally a joint publication of Basic Books and the Council on Foreign Relations, it is now a joint publication of CIHC and Routledge.